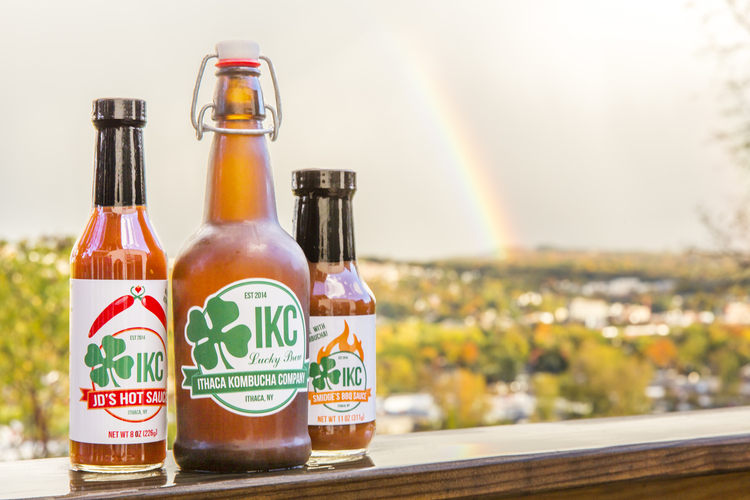 The Ithaca Kombucha Company (IKC) is a small, health conscious, eco-friendly, company whose mission is to have the highest quality and best tasting kombucha products on the market. Their drinks, vinegars, and sauces are crafted in small batches, made with organic kombucha. Brewing kombucha and crafting sauces and flavored drinks takes a great deal of patience and care. The SCOBY (a culture of good bacteria and yeast present in kombucha production) has a mind of its own. It could quickly overtake a batch if it were to sense that they are not giving it the level of attention it deserves. They carefully monitor quality while preparing, brewing, and bottling their products. It's all worth it at the end of the day when they crack open an ice cold kombucha or sit down to a dinner topped with one of their incredible sauces.